Hurricanes, people!! Hurricanes!! (I know it's hard to be a fan of them if you don't have Center Ice or something). They are playing some great hockey, have exciting young playmakers, and Brind'amour is doing a great job as coach. Oh, and they have this other old guy on the team who is pretty good, too. I cant blame you for not watching the Kings. I've watched less this year than last year. And last year I ended up half heartedly putting games on in the background without paying much attention. This year I'm not even bothering to turn the TV on most of the time. I have gone to ONE game this season, and only because the tickets were given to me for free. 2nd year in a row I wont be paying to watch a single game live. Really sad state of affairs. But the Ducks? Gross. Unless you are driving down to see games live? If not, you're better off watching Tampa Bay or Toronto. Much more exciting to watch. It's been a loooooooooooong time since Fox was better than Hayward. I just can't do it man. Same for my hometown team of Vegas, I just can't pull for these teams. Aside from them being in the same division, I just really hate these teams. There's certain players around the league I may like to watch individually, but as bad as we are, this is still the only team I can follow/pull for 100%. I just don't have it in me to do otherwise. How about you sell all of your Kings stuff and stay a Ducks fan. I would never jump ship and cheer for any other team besides the Kings, ESPECIALLY the quacks. If the best the Kings can do is bottom 10, fine, I will cheer them on and take an aspirin after every lost, vent to other fellow Kings FANS, and hope next year will be better. Fox and Foust are hard to listen to, but that's why we have Nick and Darryl. This is the problem with with fans that jumped on the wagon waving their flags AFTER a Kings Stanley Cup win. They think the Kings are a top 5 team and should be there every year no matter what, that's what they think Kings hockey is. The Kings have been a middle of the road team and most of the time barely making the playoffs. I have been through all of the ups and many downs of Kings hockey since the mid 80's, and I have never abandon them to cheer for another team no matter how bad it got. This is Kings hockey and true fans put in the time, cheer for them no matter how bad it gets, and they stay ture to the Kings. The 2 Stanley Cups are great, but those series don't compare to the 92-93 cup run. If you were watching that series back then, you know the heart break that followed and how the years went afterwards. The Kings will rebound, they will turn it around one of these seasons, but you can't turn your back on them if you call yourself a Kings fan. East Coast hockey is just more fun to watch than the boring and slow dump n chase Kings. I hate TO but man, they are fun to watch. They are fast and skilled and watching an American be one of the top players in the world in Austin Matthews is great to watch. Tampa and Washington are fun too. Ovi still plays with so much heart and passion and is a joy to watch as well. It is going to be a long while before we get to see a fun to watch team again since this core is here to stay until they retire. For me, it's the Kings or nothing. If the Kings aren't in the playoffs or get knocked off early then the whole NHL season is done with for me as far as I'm concerned. That's why it's tough to enjoy hockey this season. Every win is pointless now and it only hurts our chance at a good pick. But at the same time it's not like you want to go to Staples and actively root for them to lose either. Meh.. 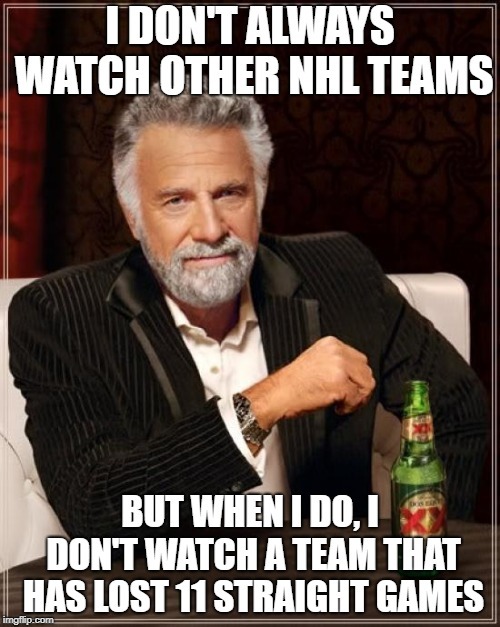 I enjoy watching NHL hockey. If the Kings aren't on that night, and the Ducks are, I'll watch (and hope they lose)....that being said, neither are playing NHL caliber hockey right now.